The building at 158-160 Main Street in the Springfield neighborhood of Indian Orchard, around 1938-1939. Image courtesy of the Springfield Preservation Trust. The early history of this building seems unclear, but it was likely among the oldest buildings on Main Street in Indian Orchard when the first photo was taken. The state’s MACRIS database estimates that it was built between 1855 and 1860, in the early years of Indian Orchard’s development. At the time, the majority of buildings on Main Street were small wood-frame structures, but over time these began to be replaced by larger brick buildings, as seen on both sides of these photos. However, this building managed to survive, with some alterations, until the late 20th century, despite being overshadowed on either side by taller neighbors. Larned Colwell died in 1889, and within a few years his widow Melissa had moved to Hampden Street. However, Walter would remain here for at least another decade, although by the 1899 city directory he had evidently left the meat business and was working as a bookkeeper for the Chapman Valve Company. He, Eliza, and Howard moved soon after, and by the 1900 census they were living a few blocks away in a house at 111 Berkshire Street. Within a few years, this property on Main Street was sold to clothing merchant Charles Bengle, who built a large commercial block at the corner of Oak Street, just to the left of this building. Then, in 1908, Octave A. LaRiviere built an even taller building just to the right, surrounding the old building on both sides. 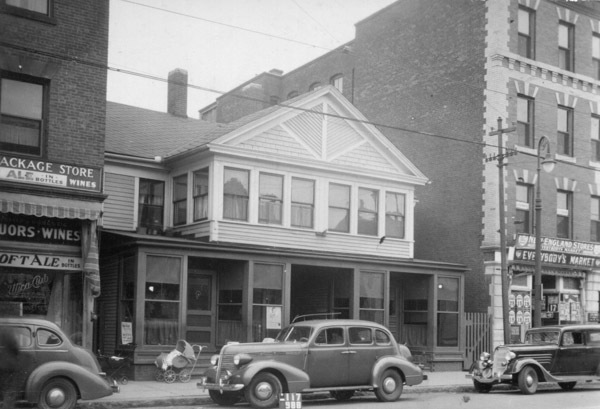 By the time the first photo was taken in the late 1930s, this building had seen a few alterations from its original appearance, including several storefronts and a cross-gable that faced Main Street. There are no legible signs in any of the storefronts to indicate what businesses were located here, but the building was used for both residential and commercial purposes for many years. It was still standing in 1984, when it was inventoried for the state’s MACRIS database of historic buildings, and a photo from this era showed two ground-floor tenants: de Sousa Real Estate and Notary Public on the left, and Casa de Portugal on the right. 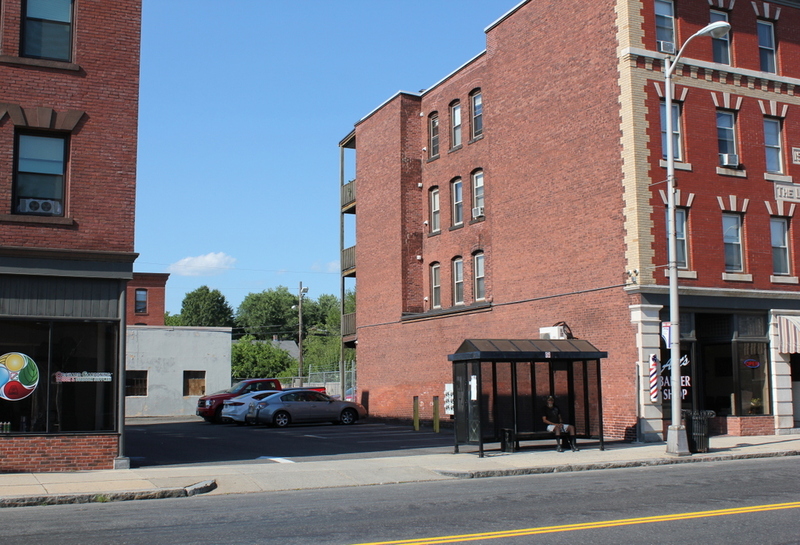 However, the building has subsequently been demolished, and today the site is a parking lot, flanked on either side by the other two buildings from the first photo.